My family had an INCREDIBLE vacation this year. 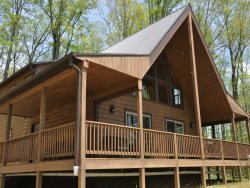 The staff at Great Smoky Mountain Rentals was extremely knowledgeable and helpful and recommended the perfect cabin for us. We loved the amenities, view and natural setting. It was definitely a Christmas we'll never forget! We had a great Smoky Mountain Holiday. We cut our own Christmas tree at a nearby tree farm and decorated it with ornaments we made in the cabin, went for hikes, walks and gem hunting. This home had everything. From breathtaking views (pictures simply don't do it justice)to the hot tub (our favorite), to comfortable beds, a well stocked kitchen, very clean and well kept, along with many extra amenities that help make it a vacation to remember. Though we were all adult travelers, there were many amenities in the home and activities in the area for those with children also. Personally, we enjoyed time at Harrah's, and the cabin is close to Bryson City so picking up necessities or grabbing a bite to eat was easy. (The road the cabin is on might be considered a little rough at first but it's only for a short ways and was easily doable in a standard car.) Between the accommodations, and Great Smokys Cabin Rental who was very helpful and responsive throughout the rental process, I can honestly say that this was the best vacation we've had in years. So much so that we decided to extend our stay an extra day, and would have stayed even longer had it been possible. Very cute cabin. Great view from hot tub. My fiance and I recently stayed here and loved it!! The pictures of this house do not do it justice. The view is spectacular and the attention to detail within the house is beautiful. I really cannot say enough about this house. We will be back! The rental staff was very friendly and called to make sure we arrived safely. We had a great stay at Peace of the Mountain. Beautiful views and great home. Having coffee on the back porch every morning was wonderful. The kitchen could use a few more large pots and pans for those who enjoy eating at home. Overall we loved it and hope to go back next year. AMAZING PLACE!! Thank you! When we come back we will stay here again Absolutely in love with this place!! The view is absolutely lovely! We loved this house! Awesome mountain views, very homey. Beautiful secluded spot. We cooked s'mores over the fire pit, used the hot tub, enjoyed this house very much. We went to Great Smoky Mountain National Park, climbed Clingman's Dome, hiked, went fishing, horseback riding, white-water rafting on the Nantahala. (Endless River Adventures was awesome) Went tubing (JJ's Tubes on Deep Creek is a must!) Loved our vacation! Thank you we hope to come back again. We had a great stay at Peace of the Mountain. Beautiful views and great home. The rental staff was very friendly and called to make sure we arrived safely. Having coffee on the back porch every morning was wonderful. The kitchen could use a few more large pots and pans for those who enjoy eating at home. Overall we loved it and hope to go back next year. We had a wonderful stay at Peace of the Mountain! The views from the back deck are incredible,, and wonderful to see cloud/sky changes throughout the day! Peaceful and restful vacation! The cabin was fantastic. Kids loved air hockey/pool table on loft We enjoyed the hot tub. Fire pit for s'mores! Kitchen wonderful, only missing a griddle for pancakes , and a few bigger pans and a dish drainer. Beds very comfy, and living area so homey! A TV in bedroom with queen bed might be nice. Even had some games and movies there, which is a lovely touch. Furniture/ decorating lovely country/mountain theme . Very clean! Washer and dryer easy access and great. We would love to stay here again!